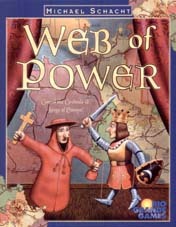 Web of Power , Michael Schact, Goldsieber / Rio Grande Games, 2000. Resources: Goldsieber site info Web of Power home page. Web of Power (known in Germany as Kardinal und König ) is a dry but beautifully produced abstract game in which players place tokens to gain control of Europe. Those of you who do not enjoy simple abstract games such as Nine Men Morris , Twixt , or Hex should probably pass on this one, but if you enjoy these games, you will likely fall head over heels for Web of Power . It plays quickly and provides a lot of strategy and decision making in its two short scoring rounds. The board is a colorful, antique depiction of 12th century Europe in which advisors and cloisters are battling for power and influence. The 9 countries in which they are battling are France, Aragon, Franken, Bavaria, Burgundy, Italy, Lothringen, England, and Swabia. Cloister pieces are played on the named villages in the countries, and advisor pieces are played on the country seal (the governmental seat). Once played, they are never moved. How do players get their pieces on the board? Each player has 3 cards to place pieces. Most cards are color coded and give you the option of placing in one of two countries. For example, the green Bayern/Burgund cards lets you play in either Bayern or Burgundy. Two cards may be combined and used as a wild card, such that a card combination of Frankreich, England/Schwaben, England/Schwaben will allow you to place two pieces in Frankreich. At the end of a move, a player gets to replenish up to three using the random draw pile or two face up cards. The doubled-up cards, the wild card rule, and the face up draw all serve to diminish luck in this game. There will be times when you have bad cards, but these rules give you several options to combat your enemies. There are many placement restrictions to help make a tight game. 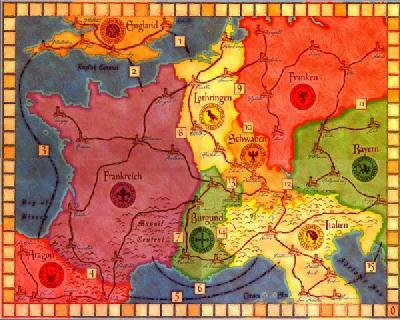 First, players must always place into one country during a turn. Players are restricted to a maximum of two piece placements, even if they have three usable cards. The first player to place into a country is limited to one piece. Because of this rule there is little advantage to going first in the game. Players often do not want to be the first into a country, and many games contain empty countries right up to near the end. Advisor placements are limited too. The total number of advisors is limited to the number of cloisters of the player who has the most cloisters in a country. So, if the first place cloister count is 3, only 3 advisors may be in that country. All these rules make for very tight and excruciating contests in a country. A margin of 1 piece can be tied fairly easily in one turn. A difference of 2 pieces is insurmountable! There are only two scoring rounds in this game, and that's what gives this game its quick forward motion. Both scorings come when the draw pile is depleted, so its twice through the deck (55 cards) and the game is over. In the first round, only the cloisters are scored. The player with the most cloisters in a country receives a number of points equal to the total number of cloisters in the country. The second place players receives points equal to the first place player's count. So if Andrew and Beth have 5 and 3 pieces in a country, then Andrew will score 8 and Beth will score 5. Ties are graciously shared between the players. That is to say two players tying for first in a country receive points as if they were the sole first place player. The second scoring round repeats this cloister scoring, but adds two more scorings. As you see in the board image, several countries are connected by numbers and represent alliances between countries. If a player has the most advisors on both side of the alliance, the player will score equal to the total number of advisors. Other players receive nothing! Once again ties are shared Thus if Carly and David each have 2 advisors each in one country, and 1 advisor each in a connected country, they will both score 6 points for the total number of advisors in the connected countries. The last mechanism for scoring is having chains of cloisters. A chain of 4 or more will score you that many points. Multiple chains can qualify, but they must be linear - branches don't count. You should see from this overview of the rules that the game plays quickly, scores fast, and is over before you know it. There are several things to recognize to play well. First, notice the card count and compare this to the number of villages in the country. The card count below represents a full 5 player game. 4 or 3 player games lose one or two of each card type. As in many card games, having a photographic memory of the cards played will help you. Having a feel for the card scarcity will help you too. Notice that there is one more card than the number of villages in all case except for Italien/Lothringen. Placements in Italien/Lothringen are slightly more scarce than other countries, especially if you can burn two in a wild card play on another country. Now compare the number of alliances for the countries. From the table you can see that Frankreich and Italien are the alliance power houses. Plays into these countries have more alliance options than other countries. Remember that although a single alliance is scored only once in the game, a powerful advisor cluster may score several times through multiple alliances. Use this knowledge wisely if you are lucky enough to have many Frankreich cards come your way. Do not make a bonehead move as I have done in the past. Once I maximized my advisors in Lothringen, Schwaben, and Italien, greedy for a big second round score. It was only later that I realized that although these countries are adjacent, they have no mutual alliances! Score a big last place for having useless advisors. Judging by the number of plays in our game group since we were introduced to this game in May, and by the number of session reports at the BoardGame Geek, this title is getting a good work out. Most of our games have been decided by fewer than 5 points, and it is not uncommon for 4 or 5 players to be grouped in a 10 point span. Many detractors of the game suggest that it is too dry or abstract. That may be true, but the game is over quickly for the amount of agonizing and calculating you must do to win. The game also works well with 3 or 5 players. I enjoy the 5 player game more, because the board is more crowded, the scores are tighter, and there is more value in burning off cards in a country. For instance, if you have the majority in Schwaben, and several Schwaben cards have already been played, burning off 2 Schwaben cards as wild cards will help cement your majority there. With more players, it is less likely that one opponent will hold enough cards to make a comeback. Of course beware the player who plays two Frankreichs and a Schwaben to make a major rebound in this tiny nation. Finally the artwork and component quality is excellent. Once again credit Franz Vohwinkel for the graphics. I have never seen an artist who can so skillfully change his style from game to game. Just look at the artwork in different styles he has created: Vampire , Ra , Space Walk , Big City . The list goes on and on. Most assuredly he will have his own wing in the Strategy Game Museum. Goldsieber also deserves credit for the nice cards and wooden tokens. Although everything is high quality, already my copy is showing signs of wear. Excellent game! [an error occurred while processing this directive] Last modified: Thursday, 09-Jun-2011 12:37:15 MST.